For the full lineage of the Porsche 911 models, see Porsche 911. The earliest editions of the 911 had an air-cooled, rear-mounted, 2.0 L (1,991 cc) 130 PS (96 kW; 130 hp) flat-6 "boxer" engine, similar to the 356's four-cylinder 1.6 L unit. It was mated to a five-speed manual "Type 901" transmission. The car had 2+2 seating, though the rear was very small, also like the 356. The styling was largely by Ferdinand "Butzi" Porsche, son of Ferdinand "Ferry" Porsche. Erwin Komenda, the leader of the Porsche car body construction department, was also involved in the design. When 356 production came to an end in 1965, there was still a market for a 4-cylinder car, particularly in the USA. The Porsche 912, a slightly downscaled 911 fitted with the 356's 90 hp (67 kW) engine, was introduced the same year as its replacement. In 1967, Porsche introduced the more powerful 160 PS (120 kW; 160 hp) 911S. Alloy wheels from Fuchs, in a distinctive 5-leaf design, were offered for the first time. A 210 PS (150 kW; 210 hp) racing version of the 911 engine was developed and used in the mid-engined Porsche 904 and Porsche 906 track cars. The Targa version, with a stainless steel-clad roll bar, appeared the same year. Porsche had feared the U.S. National Highway Traffic Safety Administration (NHTSA) would outlaw fully open convertibles, an important market for the 356. It was equipped with a removable roof panel and a removable plastic rear window (although a fixed glass version was offered alongside from 1968). The name "Targa" - shield in Italian - came from the Targa Florio sports car road race in Sicily, in which Porsche had scored seven victories since 1956, with four more to come through 1973. This last in the subsequently discontinued event is especially notable as it was won with a 911 Carrera RS against prototypes entered by Italian factories of Ferrari and Alfa Romeo. The 110 PS (81 kW; 110 hp) 911T was also launched in 1967 and effectively replaced the 912. The staple 130 PS (96 kW; 130 hp) model was renamed the 911L. The 911R, a lightweight racing version with thin aluminium doors, a magnesium crankcase, twin-spark cylinder heads, and a power output of 210 PS (150 kW; 210 hp), had a very limited production of just 20 cars. In 1969, the slightly lengthened B series was introduced. It moved the rear wheels on all 911 and 912 models 57 mm aft, increasing wheelbase from 2,211 to 2,268 mm (87.0 to 89.3 in) to remedy to the car's nervous handling at the limit. Fuel injection arrived both for the 911S and a new middle model, the 911E. A semi-automatic Sportomatic model, composed of a torque converter, automatic clutch, and four-speed transmission, was added to the product lineup. The 911 B17 is a concept designed by Pininfarina, which took a standard 911 and lengthened the wheelbase by 7.5 in (190 mm), resulting in a car that weighed almost 2,500 lb (1,100 kg). For MY 1970 the engines of all 911s were increased to 2,195 cc (2.195 L; 133.9 cu in). Power outputs were uprated to 125 PS (92 kW; 123 hp) in the 911T, 155 PS (114 kW; 153 hp) in the 911E, and 180 PS (130 kW; 180 hp) in the 911S. The 912 was discontinued, with the 914 taking its place as Porsche's entry model. Despite the lower power output of the 911E compared to the 911S, the 911E was quicker during acceleration up to 160 km/h (99 mph). The 911 C 20 was a prototype based on the standard 911 but lengthened by 13.6 in (345 mm) over the stock car. It used a 911S engine. 1972 Porsche 911 T Targa with removable roof. Notice the oil filler door on the rear right fender, which is only found on the 1972 model. The 911E and 911S used mechanical fuel injection (MFI) in all markets. The 911T was carbureted, except in the United States where it also used MFI, which accounts for the 7 kW (9 hp) power difference between the two. In January 1973, U.S. 911Ts were transferred to the new K-Jetronic CIS (Continuous Fuel Injection) system from Bosch. These CIS-powered cars are usually referred to as "1973.5" models by enthusiasts. In 1972 a tremendous effort was made to improve the handling of the 911. Due to the 911's unusual engine placement (rear-mounted, with most of the vehicle's weight concentrated over the rear axle), early 911's were prone to oversteer when driven at the limit, and could easily spin in the hands of an inexperienced driver. In an attempt to remedy this, Porsche relocated the oil tank from its position behind the right rear wheel to in front of it. This had the effect of moving the weight of almost 8.5 L (9 US quarts) of oil from outside the wheelbase to inside, improving weight distribution and thus, handling. To facilitate filling of the oil tank, Porsche installed an oil filler door (much like the fuel filler door on the left front fender) on the right rear quarter panel. Unfortunately, this unique design was scrapped after only one year, some say because inattentive gas station attendants were putting gas in the oil tank. The oil tank was subsequently relocated to its original position for model year 1973, and remained there until it was relocated within the wheelbase for the 964 models. 911S models also gained a discreet spoiler under the front bumper to improve high-speed stability. With a weight of only 1,050 kg (2,310 lb), these models are often regarded as the best classic mainstream 911s. For racing at this time, the 911 ST was produced in limited numbers (the production run for the ST only lasted from 1970 to 1971.) The cars were available with a choice of either 2,466 cc or 2,492 cc engines, producing 270 PS (266 hp; 199 kW) at 8,000 rpm. [clarification needed] Weight was down to 960 kg (2,120 lb). The cars had success at the Daytona 6 Hours, the Sebring 12 Hours, the 1000 km Nürburgring and the Targa Florio. The Carrera RS models, valued by collectors, are considered by many to be the greatest classic 911s of all-time. RS stands for Rennsport in German, meaning "racing sport". The Carrera name was reintroduced from the 356 Carrera which had itself been named after Porsche's victories in the Carrera Panamericana races in Mexico in the 1950s. The RS was built so that Porsche could enter racing formulae that demanded that a certain minimum number of production cars were made. Compared with a standard 911S, the Carrera 2.7 RS had a larger 2,687 cc (2.7 L; 164.0 cu in) engine with a bore x stroke of 90 mm × 70.4 mm (3.54 in × 2.77 in) developing 210 PS (207 hp; 154 kW) at 6,300 rpm and 255 N⋅m (188 lb⋅ft) of torque at 5,100 rpm with Bosch Mechanical Fuel Injection , revised and stiffened suspension, a "ducktail" rear spoiler, larger brakes, wider rear wheels and rear wings. In RS Touring form it weighed 1,075 kg (2,370 lb), in Sport Lightweight form it was about 100 kg (220 lb) lighter, the saving coming from the thin-gauge steel used for parts of the bodyshell and also the use of thinner glass. In total, 1,580 were made, comfortably exceeding the 500 that had to be made to qualify for the vital FIA Group 4 class. 49 Carrera RSR cars were built with 2,808 cc engines producing 300 PS (296 hp; 221 kW). In 1974, Porsche created the Carrera RS 3.0 with mechanical fuel injection producing 230 PS (227 hp; 169 kW). It was almost twice as expensive as the 2.7 RS but offered a fair amount of racing capability for that price. The chassis was largely similar to that of the 1973 Carrera RSR and the brake system was from the Porsche 917. The use of thin metal plate panels and a spartan interior enabled the shipping weight to be reduced to around 900 kg (1,984 lb). The Carrera RSR 3.0 and Carrera RSR Turbo (its 2.1 L engine due to a 1.4x equivalency formula) were made in low numbers for racing. The turbo car came second at the 24 Hours of Le Mans in 1974, a significant event in that its engine would form the basis of many future Porsche attempts in sports car racing, and can be regarded as the start of its commitment to turbocharging. MY 1974 was the introduction of impact bumpers to conform with low speed protection requirements of U.S. law, these bumpers being so successfully integrated into the design that they remained unchanged for 15 years. In 1974 the engine size was increased to 2,687 cc, giving an increase in torque. The use of K-Jetronic CIS Bosch fuel injection in two of the three models in the line up— the 911 and 911S models, retaining the narrow rear wings of the old 2.4, now had a detuned version of the RS engine producing 150 and 175 bhp (110 and 129 kW) respectively. The Carrera 2.7 was mechanically similar to the 1973 RS, inheriting its 210 bhp (157 kW) MFI engine and still weighed the same at 1075 kg (2370 lb). It had the wide RS rear wings and also the ducktail for the 1974 model (except for the German market). It was available either as a coupe or a Targa. For 1976 a special run of 113 coupes with MFI were made. In addition, 30 MFI Targas with narrow rear wings were made for the Belgian Police. The US Carrera 2.7 was restricted to the 2.7 K-Jetronic engine as the MFI RS engine was banned on emission grounds. Power output was 175 bhp (130 kW), though it was later reduced to 165 bhp (123 kW) for the U.S. market as a whole, and to 160 bhp (119 kW) in California. The well known problem of pulled cylinder head studs with the K-Jetronic 2.7 engine only occurred in hot climates. This emerged in 1975 in California where thermal reactors, aimed at reducing emissions, were fitted below the cylinder heads thus causing heat build up around the magnesium crankcase and then made worse by the lean running K-Jetronic CIS. The fitting of a 5-blade engine fan instead of the usual 11-blade further compounded the situation. Bearing in mind Porsche's largest market being the USA, the 930 Turbo, Carrera 3.0 and all subsequent models used aluminium alloy crankcases which were around 15 lb (7 kg) heavier. The Bosch K-Jetronic CIS varied fuel pressure to the injectors dependent on the mass airflow. While this system was exceedingly reliable, it did not allow the use of as "hot" cams as MFI or carburettors allowed. Therefore, the 911S's horsepower decreased from 190 to 175 PS (140–128 kW) despite the displacement increase from 2.4 to 2.7 L. However, the engine did have increased drivability. 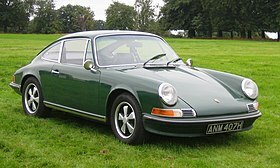 Also produced for the 1976 "model year", for the U.S. market, was the 912E, a 4-cylinder version of the 911 like the 912 that had last been produced in 1969. It used the I-series chassis and the 2.0 Volkswagen engine from the Porsche 914. In all, 2099 units were produced. In 1976, the Porsche 924 took this car's place for the 1977 "model year" and beyond. The power was supplied by a 4-cylinder high-performance fuel injection motor also used in the Volkswagen 411. Less than 6,000 were built. The Carrera 3.0 was given the same diecast aluminium crankcase as the 930 or ’911 Turbo’. Its 3-litre engine had K-Jetronic CIS fuel injection. Power output was slightly down on the Carrera 2.7 at 200 bhp (150 kW) although the 188 lb/ft of torque was now available at 4,200 rpm. Weight was up by 45 kg (99 lb) to 1,120 kg (2,469 lb). During its two-year life span, only 3687 cars were built. Of these 2564 were coupés and 1123 Targas. In 1974 Porsche introduced the first production turbocharged 911. Although called simply Porsche 911 Turbo in Europe, it was marketed as the Porsche 930 (930 being its internal type number) in North America. The body shape is distinctive, thanks to wide wheel-arches to accommodate the wide tires, and a large rear spoiler often known as a "whale tail" on the early cars, and "tea-tray" on the later ones. Starting out with a 3.0 L engine producing 260 PS (190 kW; 260 hp), it rose to 3.3 L and 300 PS (220 kW; 300 hp) for 1978. The early cars are known for their exhilarating acceleration coupled with challenging handling characteristics and extreme turbo lag. Production figures of the car soon qualified its racing version for FIA Group 4 competition as the Porsche 934 of 1976. Many participated at Le Mans and other races including some epic battles with the BMW 3.0 CSL "Batmobile". The wilder Porsche 935, a finer tuned car in FIA Group 5 that evolved from the 2.1 L RSR Turbo of 1974, was first campaigned in 1976 by the factory, and despite subsequent withdrawal of the official works team after 1978, it ultimately won Le Mans outright in 1979 in the hands of the private Kremer Racing team. Privateers continued to compete successfully with the car until well into the 1980s. Due to stricter emissions regulations, the 930 was withheld from the US and Japanese markets from 1981 through 1985. It was re-introduced into the United States in 1986. 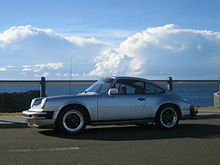 Starting in MY 1978, the new 3.0 L 911 SC (2,994 cc) was now the basic 911 model. It was in effect a Carrera 3 (known as a 911S in the United States) detuned to provide 180 PS (130 kW; 180 hp). The "SC" designation was reintroduced by Porsche for the first time since the 356 SC (as distinguished from the race-engined 356 Carrera). No Carrera versions were produced and the 930 Turbo remaining at the top of the range. Porsche’s engineers felt that the weight of the extra luxury, safety and emissions equipment on these cars was blunting performance compared to the earlier, lighter cars with the same power output, so in non-US cars, power was increased to 188 PS (138 kW; 185 hp) for 1980, then finally to 204 PS (150 kW; 201 hp). However, cars sold in the US market retained their lower-compression 180 PS (130 kW; 180 hp) engines throughout. This enabled them to be run on lower-octane fuel. In model year 1980, Porsche offered a Weissach special edition version of the 911 SC, named after the town in Germany where Porsche has their research center. Designated M439, it was offered in two colors with the turbo whale tail & front chin spoiler, body color-matched Fuchs [de] alloy wheels and other convenience features as standard. 408 cars were built for North America. In 1982, a Ferry Porsche Edition was made and a total of 200 cars were sold with this cosmetic package. SCs sold in the UK could be specified with the Sport Group Package (UK) which added stiffer suspension, the rear spoiler, front rubber lip and black Fuchs wheels [de]. In 1981, a Cabriolet concept car was shown at the Frankfurt Motor Show. Not only was the car a true convertible, but it also featured four-wheel drive, although this was dropped in the production version. The first 911 Cabriolet debuted in late 1982, as a 1983 model. This was Porsche’s first cabriolet since the 356 of the mid-1960s. It proved very popular with 4,214 sold in its introductory year, despite its premium price relative to the open-top targa. Cabriolet versions of the 911 have been offered ever since. It was during this time, that Porsche AG decided the long-term fate of the 911. In 1979 Porsche had made plans to replace the 911 with their new 928. Sales of the 911 remained so strong however, that Porsche revised its strategy and decided to inject new life into the 911 editions. 911 SC sales totaled 58,914 cars. The Porsche 911 3.2 series were available in Coupe, Cabriolet and Targa styles. A new, higher-displacement motor, a 3.2-liter horizontally opposed flat 6 cylinder, was utilized. At the time, Porsche claimed it was 80% new. The new swept volume of 3,164 cc was achieved using the 95 mm (3.7 in) bore (from the previous SC model) combined with the 1978 Turbo 3.3 crankshaft's 74.4 mm (2.9 in) stroke. In addition, higher domed pistons increased the compression ratio from 9.8 to 10.3:1 (although only 9.5:1 for the US market). New inlet manifold and exhaust systems were fitted. The 915 transmission was carried over from the SC series for the first three model years. In 1987, the Carrera got a new five-speed gearbox sourced from Getrag, model number G50 with proven Borg-Warner synchronizers. This slightly heavier version also featured a hydraulically operated clutch. With the new engine, power was increased to 207 bhp (154 kW; 210 PS) at 5,900 rpm for North American-delivered cars and to 231 bhp (172 kW; 234 PS) at 5,900 rpm for most other markets. This version of the 911 accelerated from 0– 60 mph (97 km/h) in 5.4 seconds (Car & Driver tested 5.3 seconds for the US version) and had a top speed of 150 mph (240 km/h) as measured by Autocar. Factory times were more modest: 0-60 mph time of 6.3 seconds for the US version and 6.1 seconds for cars outside the American market. The disc brakes were increased in size to aid in more effective heat dissipation and improved oil-fed chain tensioners were fitted to the engine. To improve oil cooling, a finned cooler replaced the serpentine lines in the front passenger fender well. This was further improved in 1987, with the addition of a thermostatically controlled fan. Driving refinement and motor reliability were improved with an upgrade of the fuel and ignition control components to a L-Jetronic with Bosch Motronics 2 DME (Digital Motor Electronics system). An improvement in fuel-efficiency was due to the DME providing a petrol cut-off on the overrun. Changes in the fuel map & chip programming from October 1986, further improved the power to 217 bhp (162 kW; 220 PS) at 5,900 rpm for North American delivered cars as well as for other markets requesting low emissions, like Germany. Custom-mapped chips remain a popular upgrade. The fuel relay that is mounted externally on the DME is known to be a weak point of the system. Three basic models were available throughout the Carrera years – coupé, targa and cabriolet. When launched in 1984 in the United States, the prices of the 911 Carrera lineup were $31,950 for the coupé, $33,450 for the targa and $36,450 for the cabriolet. Almost indistinguishable from the SC, external clues are the front fog lights, which were integrated into the front valance in the Carrera. Very modest cosmetic changes were made throughout the lifespan of the Carrera, with a redesigned dash featuring larger air conditioning vents appearing in 1986. In 1984, Porsche also introduced the M491 option. Officially called the Supersport, it was commonly known as the "Turbo-look". It was a style that resembled the Porsche 930 Turbo with wide wheel arches and the distinctive "tea tray” tail. It featured the stiffer turbo suspension and the superior turbo braking system as well as the wider turbo wheels. Sales of the Supersport were particularly strong for its first two years in the United States because the desirable 930 was not available. The 911 Speedster (option M503), a low-roof version of the Cabriolet which was evocative of the Porsche 356 Speedster of the 1950s, was produced in limited numbers (2104) between January 1989 and July 1989 as both a narrow body car and a Turbo-look, which also featured 930 brakes, wheels, suspension, and front valence. 171 narrow body examples were built, and 823 examples were built for the US market. It started as a design under Helmuth Bott in 1983 but was not manufactured until six years later. It was a two-seat convertible that featured a low swept windshield. In 1985, Porsche built a Club Sport prototype with the identification number WP0ZZZ91ZF100848. Later on in that year, a Carrera Club Sport (Row) with the identification number WP0ZZZ91ZFS101166 was special ordered after a Porsche driver was particularly inspired by the club sport prototype on the track. In 1987, Porsche decided to produced 340 units for their customers that wanted a track inspired road car, the club sport lost around 50 kg (110 lb) in weight by ditching non-essential equipment such as the radio, sunroof, A/C and the rear seats. By 1989, the club sport was no longer produced which makes it today a collectible with its blueprinted engine and low production numbers. Total production of the 911 3.2 Carrera series was 76,473 cars (35,670 coupé, 19,987 cabrio, 18,468 targ a). In late 1989, the 911 underwent a major evolution, with the introduction of the Type Porsche 964 (1989–1993). Singer Vehicle Design produces an extensively modified version of the Porsche 911. A model shown at The Goodwood Festival of Speed in 2018 had a 500 hp 4.0 liter air-cooled flat six engine which revs to 9000 rpm. The average price of the restoration services offered by Singer Vehicle Design are $600,000. When 911 sales began to decline by the early 1970s, Porsche executives approved work on the Porsche 928 in 1971. Larger, and featuring a front-mounted V8 engine considerably more powerful than the contemporary 911's flat six, the 928 was intended to be a comfortable grand tourer rather than a dedicated sports car. Capable of out-accelerating and even matching or exceeding the 911's cornering prowess in some model years, the 928 sold reasonably well from its introduction in 1977 until its discontinuation in 1995. In spite of its overall capability, it never outsold the 911; and unlike its smaller, sportier sibling, it achieved little success in racing. The Porsche factory's first 911-based race car was a lightly modified 1964 Type 901. It finished fifth in the 1965 Monte Carlo Rally and is now housed in the Porsche Museum. Porsche 911s dominated the Trans Am Series under two liter class in the sixties, winning the championship from 1967-1969. They would later go on to win the championship in 1973, 1974, and 1980. Despite Trans Am being a sedan championship in its early years, the Porsche 911 was a sports car. Its inclusion is likely due to its resemblance to a coupé. ^ a b Kandell, Jonathan (1998-03-28). "Ferdinand Porsche, Creator of the Sports Car That Bore His Name, Is Dead at 88 (obituary)". The New York Times. Retrieved 2008-02-06. ^ "Website for Sportomatic Porsche models". Sportomatic.org. Archived from the original on 2011-07-28. Retrieved 2010-10-03. ^ a b "Future: Porsche Panamera". Motortrend.com. Retrieved 2010-10-03. ^ Nick D & Richard Owen, ed. (April 24, 2016). "1973 Porsche 911 Carrera RS 2.7 Lightweight". supercars.net. Retrieved 2018-06-12. ^ Rusz, Joe (October 2011). "The Porsche 911: Born to Race". Road & Track. 63 (2): 59. Wilkinson, Stephan (2005) "The Gold-Plated Porsche". The Lyons Press. ISBN 1-59228-792-1, rebuilding a 911. Wikimedia Commons has media related to Porsche 911 classic.